I've lightly redacted the details. If you're particularly interested in making something like this work, I'm available for consulting! Here's a tip for Mavericks users especially, and probably Yosemite. 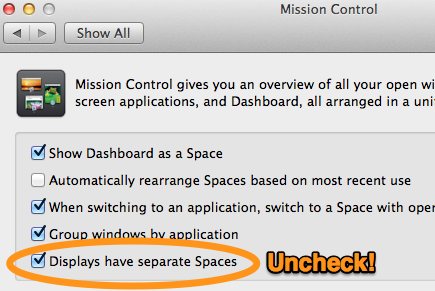 When "Displays have separate Spaces" is checked, every display connected to your computer has a Menu Bar. Even if you're, say, using Final Cut Pro 7 to play back videos with full screen output on a secondary screen. It's the sort of thing you might not notice with an Atem switcher, since it has overscan on its preview monitor that might, hypothetically, not show you something like a menu bar before your device is streaming live to hundreds of thousands of viewers. Also, you might be interested to know that in order to disable this, you need to reboot (or at least log out of) your system. SSDs are amazing devices, but this kind of thing will still spike your producer's blood pressure. I was generally tracking tweets as the show went on. Maybe especially after we made a mistake (and we made a couple), but on the whole, Twitter seemed pretty happy with our presentation. I bet they do it again, and I bet the other big players join in next year. For me, it was a chance to exercise some skills in live TV production that go back to the very beginning of my video career, and which I don't often get the opportunity to pull out these days. Improvising a way to get all the video into the switcher and back out again felt a lot like the days of building stuff just because the components were there in the closet in my public access days. And getting to do it for Nintendo was icing on the cake. Not just because as a gamer, I was more excited by their offerings this year than Sony or Microsoft, but because working with the Treehouse folks felt like working with the modern day version of the Nintendo Power Counselor's Corner. This is one of those gigs that teenage me would have been pretty excited to know was coming.